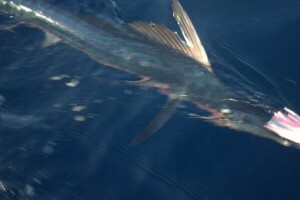 ← January 29, 2013 Mike and Linda Score 3 Spearfish and Mahimahi! February 2, 2013 Mike Day 2 & 3 – More Stripeys, Spearfish and Mahimahi! Mike and Linda from Minneapolis fished a few days ago with me and they were back for more offshore action. Linda decided to enjoy the sun and spa on our next two days of fishing so Mike and I headed out to see what we could raise. On day 2 I decided to stay out in the deep as we had done a few days before. On day 1, we caught 3 shortnose spearfish, missed another and caught a nice mahimahi. Today I decided to take a similar route and fish far offshore. We ran to the 1000 fathom line and started trolling. It took a while, but we managed to catch a nice striped marlin about 60lbs. A good friend of mine needed a fish for his daughters party so we decided to take it and give it to him. Later in the day we missed another striped marlin and that was it. Day 3 the bite went wide open! On day 3 Mike and I headed out to the deep again in the same area we had been fishing the last few days. The fish were there! Early in the day a nice spearfish showed up on the stinger…Mike got in the chair and fought our first spearfish to the boat. We quickly reset our lines and about 10 minutes later the short rigger, stinger and long rigger came crashing down! Mike and I both watched as the water erupted behind each lure…it was a triple! At first I thought it maybe a triple striped marlin bite but the fish dove deep like tuna. Mike and I worked together and boated three nice ahi about 1o-15lbs each…perfect for eating! We set up again and I worked the area searching for more fish. Again, it didn’t take long before another nice shortnose spearfish inhaled the long rigger lure…Mike fought his second spearfish of the day which weighed about 25lbs. The fish were in this area so we continued trolling in a 2 mile by one mile area. Again, the long rigger came crashing down and Mike fought his second spearfish of about 30lbs to the boat! We definitely had the fish located and I wasn’t going to move far from this spot. 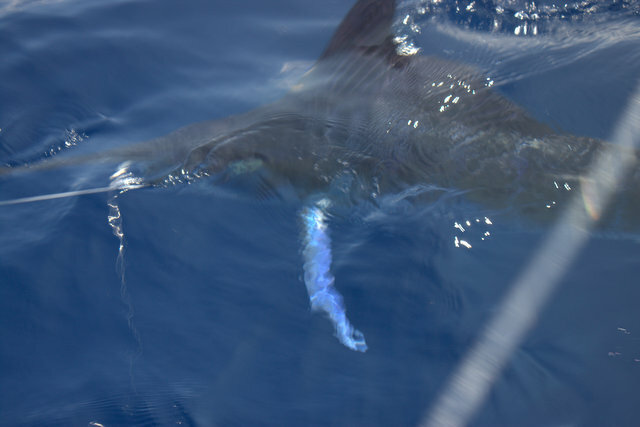 Shortly there after, we missed a short nose spearfish on the same long rigger lure. This lure on this position has been hot the last few days and the fish were definitely choosing this lure over the others. I had heard of some bites a little shallower so we headed into the ledge. On our first pass on the ledge the long rigger again came down with a solid bite! 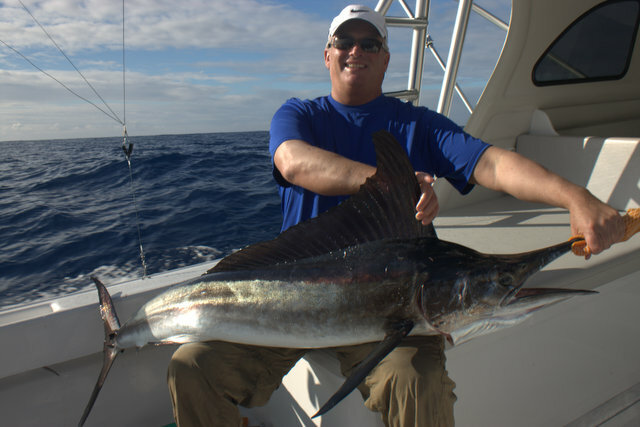 Mike got buckled into the chair as a nice striped marlin came up jumping a few hundred yards behind the boat! Mike worked the fish to the boat and we quickly released our third billfish of the day in about 10 minutes! His stripey was about 70lbs! We continued to work the ledge and missed another striped marlin. As we headed back to the harbor we had a double mahimahi strike and managed to get one of them in…unfortunately it was the smaller of the two! The other looked a little over 20lbs! We would end the day releasing one striped marlin, two shortnose spearfish, a nice mahimahi and three ahi! Overall, Mike and Linda had three really good fishing days! 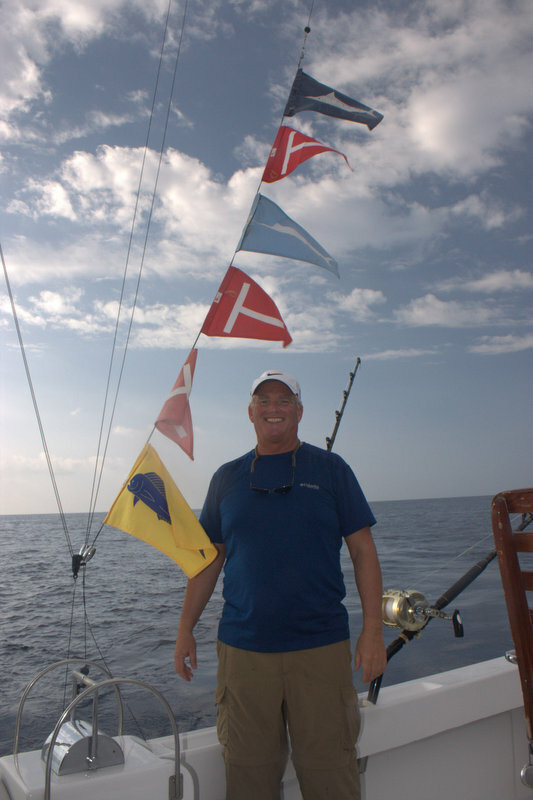 They would end their three days with five shortnose spearfish, two striped marlin, two mahimahi and three ahi! We did fish the Love to Fish Tournament the next day but things definitely changed. We only had one bite and missed it and the rest of the fleet struggled to even get a bite. The current as of now has changed for the better and the bite has improved! Mike and Linda will be back in May and hopefully we can get them into a nice blue marlin and a big ahi!